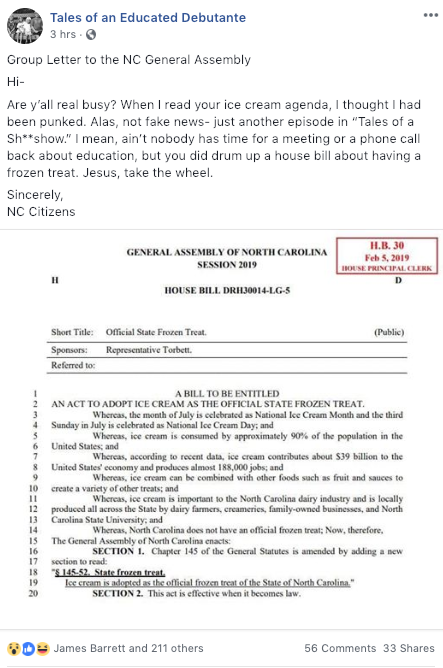 Rep. John Torbett (R-Gaston) filed House Bill 30, which would make ice cream the official state frozen treat. The bill was filed on behalf of a teacher who wanted to show students how a bill (hopefully) becomes a law. 3/3 or 4. I said that my office would be proud to help the students in their venture of learning how government works. Yesterday I filed HB 30 Designating Ice Cream as the official State Frozen Treat.